File photo of OSCE observers in Ukraine. AN AMERICAN MONITOR with the Organisation for Security and Co-operation in Europe died yesterday after a mission patrol vehicle hit a landmine in the Russian-backed separatist east, eliciting sharp words towards Moscow from US Secretary of State Rex Tillerson. It marked the first loss for the security body’s Special Monitoring Mission (SMM) since Europe’s only current war broke out more than three years ago. The OSCE’s announcement about the US monitor’s death saw Kiev and the insurgents quickly trade blame over who was at fault for one of the most diplomatically sensitive episodes in a conflict that has claimed more than 10,000 lives. 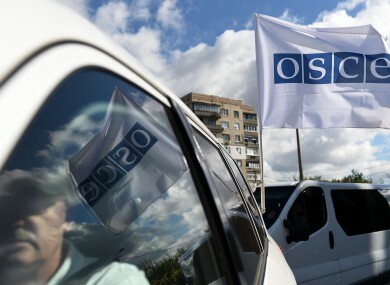 The deputy head of the OSCE monitoring mission said the patrol consisted of six members who were travelling in two armoured vehicles near the village of Pryshyb in a rebel-run region of the separatist fiefdom of Lugansk. “The explosion resulted in the death of an OSCE patrol member, a citizen of the United States,” Alexander Hug told reporters in Kiev. He also said two others — a German and a Czech national — were wounded and “undergoing further evaluation” in a Lugasnk hospital. The OSCE said it would not release the names of the casualties until their families had been notified. “We are determined to continue to implement our mandate,” Hug stressed. Tillerson in a phone conversation Sunday with Ukrainian President Petro Poroshenko said Moscow’s actions in eastern Ukraine remain an obstacle to improved US-Russian ties, the State Department said. “Secretary Tillerson phoned Ukrainian President Petro Poroshenko today to discuss his recent trip to Moscow and his message to the Russian leadership that, although the United States is interested in improving relations with Russia, Russia’s actions in eastern Ukraine remain an obstacle,” said acting spokesman Mark Toner. The statement said Tillerson accepted Poroshenko’s “condolences” for the death of the American. German Chancellor Angela Merkel said the blast underscored the need for the warring sides to “finally respect” a long-ignored ceasefire agreement negotiated by Moscow and Kiev with the help of Paris and Berlin in February 2015. “The separatists supported by Russia who illegally occupy part of Ukrainian territory by violence have a special responsibility here,” Merkel said in a strongly-worded statement. EU foreign affairs chief Federica Mogherini said the incident was a “reminder of the urgent need for progress on a peaceful resolution of the conflict”. Both Kiev and the West accuse Moscow of plotting and backing the fighting in reprisal for the February 2014 ouster of Ukraine’s Kremlin-backed leadership. Russia denies this and in turn accuses the US State Department of fomenting the 2013-14 street protests that ended up allying ex-Soviet Ukraine with the West. The OSCE team’s 600 members in eastern Ukraine are the only independent monitoring mission in the devastated industrial war zone. Email “American security monitor killed by landmine in rebel-held east Ukraine”. Feedback on “American security monitor killed by landmine in rebel-held east Ukraine”.